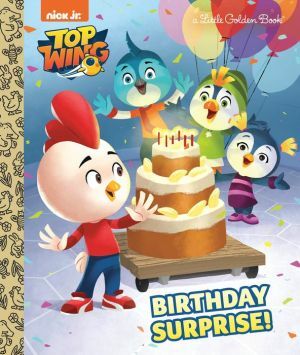 A new birthday-themed Little Golden Book starring the characters from Nickelodeon's Top Wing! Nickelodeon's Top Wing cadets Rod, Swift, Penny, and Brody star in a high-flying adventure in this full-color Little Golden Book that is perfect for boys and girls ages 3 to 7. When monkey bandits take Rod's birthday cake, it's up to Swift to save the day--and the cake! Little Golden Books have been loved by children for 75 years. Today Little Golden Books feature such beloved classics as The Poky Little Puppy and Scuffy the Tugboat, as well as hot licenses and new original stories--the classics of tomorrow, ready to be discovered between their sturdy cardboard covers and gold-foil spines.